The scale of the abuse revealed in the Nauru files has led many to ask whether there is some way to use the courts, or international law, to end offshore detention. There have been many domestic legal challenges in Australia. The most recent challenge to offshore processing was decided in the High Court in February. It failed in large part because the government simply changed the law to make much of the court challenge redundant. The Labor Party’s support for offshore processing guarantees the Coalition’s ability to pass whatever laws are needed to prop it up. February’s case found that it was perfectly legal for Australia to pay for the operation of the offshore camps run by another country for Australia. Previously the High Court has found that indefinite detention is legal for administrative purposes even if there is no prospect of release. Changes to the law to get around court decisions have been commonplace. Between 1996 and 2002, the Labor Party voted for every change in refugee law that the Howard government wanted; voting for temporary protection visas in 1999. The Migration Act has been amended time and time again. Among many drastic changes, the 2014 Asylum Legacy Act restricted the definition of a refugee and removed some appeal rights from asylum seekers making application for protection. Australia’s constitution provides little in the way of enforceable rights, with nothing similar to the bill of rights in the US constitution. This means there are few restrictions on the ability of the government to simply change the law. Australia is also clearly breaching a number of international agreements that it has signed. Sometimes the government pretends to meet the letter of the law, while completely violating its spirit and purpose. For instance asylum seekers arriving by boat directly from Sri Lanka and Vietnam are now routinely “screened out”. The have their asylum claims swiftly rejected in a farcical assessment performed at sea. “Enhanced screening” allows the government to claim that they are not returning people at risk of persecution. The UN Human Rights Committee has repeatedly held that Australia is in breach, for instance, of the International Covenant on Civil and Political Rights, an agreement which guarantees protection against arbitrary imprisonment. This is just one of a number of international conventions, like the Convention of the Rights of the Child, which supposedly bind Australia. Condemnation of the Australian government for breaching international law carries some moral weight. But international agreements are not legally enforceable, unless they have been specifically incorporated into Australian domestic law. There is no international court or body capable of enforcing international law. The few international courts that exist have limited power and can only operate if a country agrees to be bound by them. In 2014 independent MP Andrew Wilkie referred the Australian government to the International Criminal Court (ICC) over its treatment of refugees. But the ICC takes on very few cases, and cases can only be initiated by state parties or by the court itself. It has so far indicted only 39 people, all African nationals for crimes committed during wars. International law is not some impartial, independent world authority. It exists in a world order where the most powerful states like the US, and its allies including Australia, control the outcomes and hypocritically avoid responsibility for human rights abuses and war crimes. The 2003 invasion of Iraq was an illegal war, but neither former President George W Bush nor anyone in his administration has been prosecuted for war crimes. 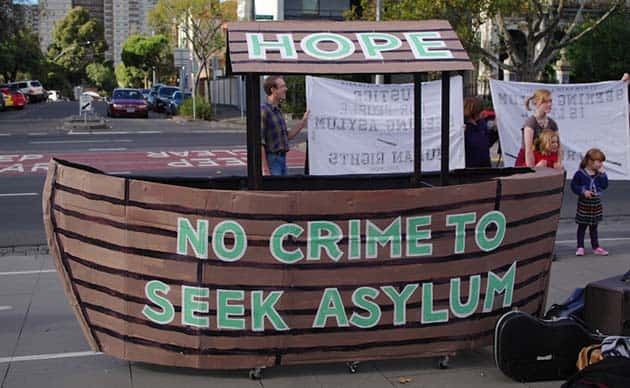 The campaign for refugee rights should certainly use whatever limited avenues the courts provide to try to end the detention and punishment of refugees. In April this year, PNG Supreme Court held the detention of asylum seekers on Manus Island was illegal. This decision puts pressure on the Australian government to bring them to Australia, but the court cannot actually force Australia to act. Ultimately it is only mass political campaigning within Australia that can force change. The #LetThemStay campaign earlier this year was a perfect example. The loss of the High Court case keeping the 267 refugees from Nauru and Manus Island in Australia meant there was no legal barrier to sending them back to the offshore camps. But a wave of mass protests and opposition has kept them in Australia. The same is true with regard to ending offshore processing. The camps were shut once before. The mass movement in support of refugees shifted public opinion and Labor policy and Nauru was closed in 2008 after John Howard lost power. As the momentum for change grows once more, we need to focus on building the mass movement that is key to shutting them again.